Runtime per charge: 10-20 mins. The original Tonka RC Ricochet was a well-built, high-quality toy that suffered a little in performance because of a couple of small details. They stopped making it, but thankfully there's a replacement, the Ricochet Stunt Pro ("Replay" version). It took very little time in the store before even buying it to notice that this was no typical "updated" re-release with a new body & color scheme. Hasbro seems to have paid attention to feedback from RC Maniacs like you and reviewers like me, because on the surface, it looks like they fixed everything that was wrong with the original, releasing what is almost an entirely new vehicle. The Tonka Ricochet Stunt Pro features tires that are made with a soft, grippy rubber, and they're hollow & squishy to help absorb shocks and conform to terrain. It's significantly shorter than the original and uses traditional front steering instead of articulating in the middle of the chassis. The controller feels similar to the last one, except this one now has no antenna. Surprisingly, it's a high-tech 2.4GHz band radio set, which means you never have to worry about frequency conflicts with any other RCs. You could get two of the exact same vehicle in the same color and race them against each other. There are also three unusual extra buttons on the controller, marked with the universal symbols for "Record," "Play," and "Stop." You can actually record a series of moves into the controller, then have it repeat it at any time. There is also a 4-position switch that essentially gives you four memory slots in which to store different moves for it to use later. Novel idea. Ok, first things first. The Ricochet Stunt Pro has digital proportional throttle and steering controls. Movements are very smooth and very controllable. The top speed on flat ground is pretty respectable. Things become more fun when you get away from perfectly smooth, obstacle-free surfaces. Put a piece of 2x4 lumber across its path and hit it at full speed. The vehicle will jump up in the air dramatically and might do a half backwards flip, landing upside-down. That's no problem, since the Ricochet Stunt Pro was designed to drive on either side equally well. Over medium gravel the Ricochet Stunt Pro feels right at home. It moves barely slower than on flat asphalt and treats the smallest bumps like they're not there. A friend and I kept taking it to rougher and rougher terrain, and we kept being equally surprised that it was able to keep going, even through dry weeds and over really rocky dirt clods. Sometimes driving into something too tall for it to scale, it would just flip over backwards and drive away, or if we caught a tire in a rut while turning at speed, it would roll over sideways and then just keep going. I've seen & driven enough RCs that it's difficult for one to impress me at the highest level, but for a toy-grade, the Tonka Ricochet Stunt Pro was blowing my mind with its toughness and capabilities. I did try out the memory feature on the controller, and it works as expected, but honestly I was more interested in maintaining full control of the vehicle myself. I do think a lot of kids, though, will like being able to hit one button to make the vehicle do different things that they recorded. 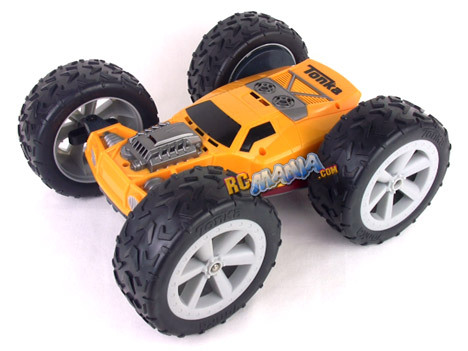 The Tonka XT Ricochet Stunt Pro RC vehicles represent, at the time of this writing, the state of the art in performance for higher-end toy-grade RC cars & trucks. For the price especially, with all batteries included, I just don't think it gets better than this. It has enough speed to be enjoyable on street-like surfaces, digital proportional controls, a hassle-free, antenna-free high-frequency radio setup, and the ability to be tossed around with jumps & rough terrain without breaking or even needing to be flipped back onto its wheels. Great stuff. Glad I bought it.